Through the Regional Conference on Women in Latin America and the Caribbean, the Latin American and Caribbean States have almost four decades of experience in generating successive consensuses —with the support and participation of civil society— aimed at eliminating gender inequality and ensuring fulfilment of women’s rights and autonomy. Efforts to integrate women into development, which started out as the central focus, now represent fresh challenges, among which sustainable development with gender equality is of special significance. 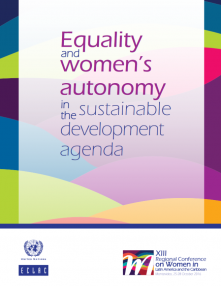 This document is both an invitation and a tool to contemplate the future, consolidate the progress made, embrace long-postponed commitments and obligations regarding women’s rights, and pave the way for the region to attain sustainable development with full gender equality.